As he is both a Gynaecologist and Urogynaecologist he can see women who have both gynaecological problems and bladder symptoms, which is really useful as often these can occur at the same time. 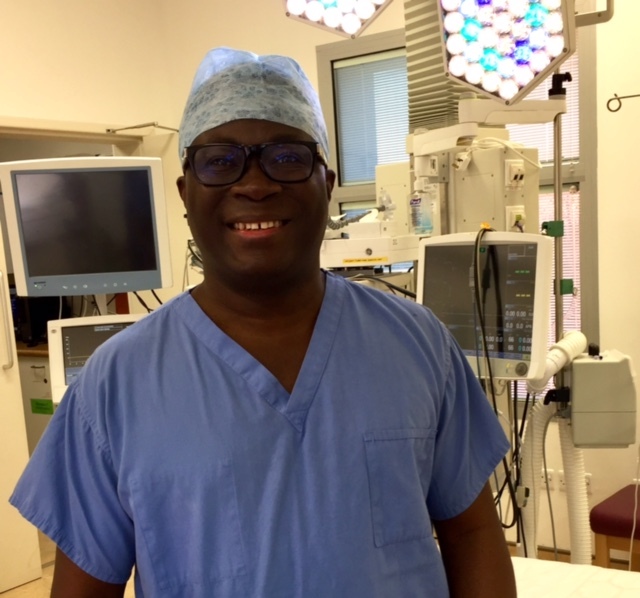 Mr Fiadjoe also has an interest in modern treatments for heavy periods and pelvic pain, which can often be performed in a day case setting. He has expertise in the laparoscopic (key hole) treatment of endometriosis. Mr Fiadjoe spent a year researching into Female Bladder problems and Vaginal wall Prolapse with Professor Rane in Australia. He holds a Urogynaecology Fellowship from the Royal Australian and New Zealand College of Obstetrics and Gynaecology. Mr Fiadjoe lectures on aspects of Gynaecology and Urogynaecology at meetings both internationally, and within the UK. He has publications in both medical and scientific journals, along with published book chapter. Mr Fiadjoe is happily married; enjoys travelling, sports especially football, tennis and golf. I love charity work and continue to operate with other Internationally renowned Urogynaecologist in India and Africa. Mr Fiadjoe is very approachable, easy going and always aims to put patients at their ease.